Evelyne’s art spans a variety of materials, methods, and subject matter, but all have the common element of intention. Her work seeks to create beauty and inspire through color, symbolism, and style. 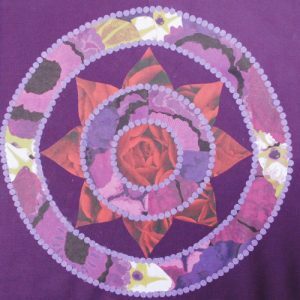 She has found mandalas to be a strong tool for meditation and use them frequently in her own meditation practices. Each mandala is hand created with positive intentions for the viewer. Some are created with acrylic, some with watercolor, and some with paper. Her jewelry is all hand-made. Some include images of my paintings or mandalas, other have real flowers embedded in them, and others are created with upcycled materials such as her cuff bracelets.